When it comes to moving around in the course of a small business’ every day efforts, finding parking can be one of the most daunting tasks there is. QuickPay looks to make that a lot simpler with a little help from mobile devices. QuickPay, now operating under the auspices of new CEO Barney Pell, who may be formerly recognized from his time at Powerset (which was itself purchased back in 2008 by Microsoft, paying out fully $100 million), provides a whole new approach to parking. What it actually does is allow users to not only find parking, quickly and easy–not to mention graphically as the available parking is shown on a map–but it also allows for a kind of remote payment system. Instead of paying the parking garage, users pay QuickPay, which in turn pays the parking garage and allows users to just show their confirmation codes instead of handing over payment to the parking attendants. This in turn allows for not only more flexibility on the part of those looking for parking, but also for the parking garage. 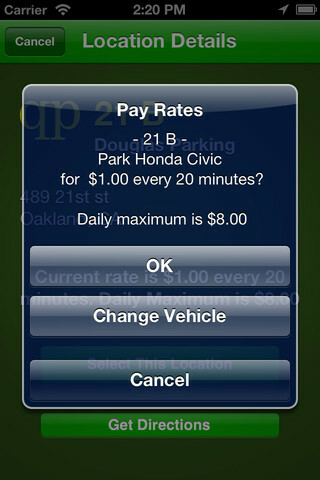 The garage can, with QuickPay, make adjustments to its parking garage rates as needed, like during weekends or events when more demand is placed on the parking garage. QuickPay’s largest limitation is to its overall usefulness. While it’s great to be able to find parking spaces, and pay for them quickly and easily–and the app is certainly set up very nicely with a focus on ease of use–the problem is that, right now, QuickPay can only be used in California, Colorado, and Nevada. Worse, it can only be used at 12 cities in those three states, and even in only 100 specific locations in those 12 cities. In other words, QuickPay is only slightly less than completely useless, right now. Naturally, as total locations increase, QuickPay’s usefulness will do likewise, but until then, it’s not going to do a whole lot unless you’re in one of those three states, and near one of those 100 locations. Easy access to parking, meanwhile, will be a help, but only so far; including some cloud-based telephony tools like hunt groups and call recording features will help ensure all those extra customers you’ll be able to make contact with by way of your improved access to parking will be more readily able to make contact with you. QuickPay is one of those apps that may not be too useful today, but will likely be much more useful at another time, after some improvements have taken place. It’s worth getting today, sure enough, but whether it’s worth using will depend largely on your location. This entry was posted in Halloo by Steve. Bookmark the permalink. Thanks for trying out the app and including us in your blog. Locations are primarily in the SF Bay Area, Denver, and Las Vegas today, but we are expanding quickly!